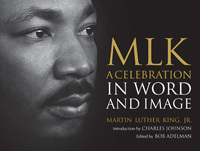 Editor: Bob Adelman Author: Martin Luther King Jr.
MLK: A Celebration in Word and Image is an unprecedented collection of black-and-white photographs combined with stirring quotations by Dr. Martin Luther King, Jr. This treasured collection includes images by legendary photographers such as Henri Cartier-Bresson, Bob Adelman, and Flip Schulke, and is an unparalleled photobiography that presents intimate moments from King's personal and public journey. We see King in all his manifestations-as a new father and doting husband, as a civil rights champion leading racial protests, and as a charismatic speaker preaching electrifying sermons. Triumphant events like King delivering his "I Have a Dream" speech and marching in Montgomery are beautifully captured, as are private moments of him reflecting on his Nobel Peace Prize or working in his study. Threaded together, these words and images chronicle how Dr. King was not only a driving force for change but also a continually evolving individual. A collection to savor and celebrate, these great photographs are an enduring testament to the life and legacy of an international icon.